Thailand is rushing to contain the spread of rabies after a spike in cases across the country. The virus has been detected in 40 provinces including popular tourist areas Bangkok and Chiang Rai. Three infected people have died this year. Rabies is passed on to humans from infected animals and is almost always fatal. Authorities say the outbreak is "under control" and aim to vaccinate 10 million dogs and cats by September. The World Health Organisation say vaccinating dogs is the most effective means of preventing rabies in humans. How bad is the outbreak? There have been 400 confirmed cases of rabies in animals in Thailand since the beginning of the year, according to the Department of Livestock Development (DLD). That's double the number over the same period in 2017. Dogs are the main carrier of rabies in Thailand, followed by cows and cats. The DLD has blamed the jump in cases on pet owners not vaccinating their animals, while some local media reports suggest the vaccine has not been made readily available. Failure to immunise pets in Thailand is an offence punishable by a 200 baht ($6.40, £4.60) fine. What is being done in Thailand? Authorities have begun vaccinating animals against the disease. The DLD has set a target to immunise 10 million cats and dogs by September this year. The department say "more than 80% of dogs and cats" in the country will be vaccinated, adding that there was "more than enough vaccine" available. Director-general of the DLD Apai Sutti said Thailand wants to eliminate rabies by 2020. What happens if you get rabies? Rabies is almost always fatal in humans and animals. The virus affects the central nervous system, with symptoms including anxiety, headaches and fever. The infection causes tens of thousands of human deaths every year, mainly in Asia and Africa. Humans can be vaccinated against the virus. The rabies vaccine is still effective even if given some time after exposure to the infection. Should you be worried about rabies in Thailand? 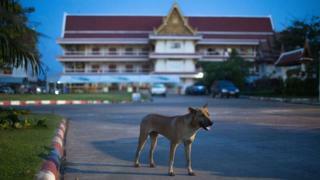 The Centers for Disease Control and Prevention (CDC) say rabies is "not a major risk" to most travellers to Thailand. However, the CDC does advise travellers likely to be involved in outdoor activities, or those going to remote regions, to be vaccinated against rabies. Children are also advised to be vaccinated as they are more likely to play with animals and might not report being bitten.